Charles of Austria was born August 17, 1887, in the Castle of Persenbeug in the region of Lower Austria. His parents were the Archduke Otto and Princess Maria Josephine of Saxony, daughter of the last King of Saxony. Emperor Francis Joseph I was Charles' Great Uncle. Charles was given an expressly Catholic education and the prayers of a group of persons accompanied him from childhood, since a stigmatic nun prophesied that he would undergo great suffering and attacks would be made against him. That is how the "League of prayer of the Emperor Charles for the peace of the peoples" originated after his death. In 1963 it became a prayer community ecclesiastically recognized. A deep devotion to the Holy Eucharist and to the Sacred Heart of Jesus began to grow in Charles. He turned to prayer before making any important decisions. On the 21st of October, 1911, he married Princess Zita of Bourbon and Parma. The couple was blessed with eight children during the ten years of their happy and exemplary married life. Charles still declared to Zita on his deathbed: "I'll love you forever." 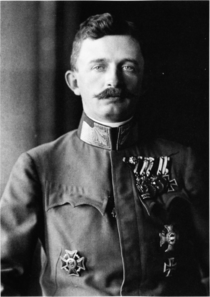 Charles became heir to the throne of the Austro Hungarian Empire on June 28, 1914, following the assassination of the Archduke Francis Ferdinand. World War I was underway and with the death of the Emperor Francis Joseph, on November 21, 1916 Charles became Emperor of Austria. On December 30th he was crowned apostolic King of Hungary. Charles envisaged this office also as a way to follow Christ: in the love and care of the peoples entrusted to him, and in dedicating his life to them. He placed the most sacred duty of a king - a commitment to peace - at the center of his preoccupations during the course of the terrible war. He was the only one among political leaders to support Benedict XV's peace efforts. As far as domestic politics are concerned, despite the extremely difficult times he initiated wide and exemplary social legislation, inspired by social Christian teaching. Thanks to his conduct, the transition to a new order at the end of the conflict was made possible without a civil war. He was however banished from his country. The Pope feared the rise of communist power in central Europe, and expressed the wish that Charles re establish the authority of his government in Hungary. But two attempts failed, since above all Charles wished to avoid the outbreak of a civil war. Charles was exiled to the island of Madeira. Since he considered his duty as a mandate from God, he could not abdicate his office. Reduced to poverty, he lived with his family in a very humid house. He then fell fatally ill and accepted this as a sacrifice for the peace and unity of his peoples. Charles endured his suffering without complaining. He forgave all those who conspired against him and died April 1st 1922 with his eyes turned toward the Holy Sacrament. On his deathbed he repeated the motto of his life: "I strive always in all things to understand as clearly as possible and follow the will of God, and this in the most perfect way". Speaking in exile, Charles said: "As long as God gives me strength to carry out my duty, I shall not abdicate the throne to which I am bound by sacred oath." When Charles was dying, he called his son Otto, the heir, to his bedside for a last talk; next day he said of Otto: "He has to know how one conducts oneself in such situations - as Catholic and as Emperor." Fifty years after his death, Charles' body was examined and discovered incorrupt. The Catholic Church has praised Charles for putting his Christian faith first in making political decisions, and for his perceived role as a peacemaker during the war, especially after 1917. The Church considered his brief rule to have expressed Roman Catholic social teaching, and he created a social legal framework which survives in part to this day. The cause or campaign began in 1949 when testimony of his holiness was collected in the Archdiocese of Vienna. In 1954, he was declared venerable, the first step in the process of beatification. On January 31, 2008, an ecclesiastic tribunal, after a 16-month investigation, formally recognized a second miracle attributed to Charles I (required for his Canonization as a Saint in the Catholic Church); in an uncommon twist, the Florida woman claiming the miracle cure is not Catholic, but Baptist. The story begins when Joseph and Paula Melançon, a married couple from Baton Rouge, Louisiana and friends of the healed woman, travelled to Austria, where they met Archduke Karl Peter, son of Archduke Rudolf, and grandson of the holy Emperor Charles. The Archduke invited the couple to his grandfather's beatification in Rome in 2004. Mrs. Melançon gave the novena to Blessed Charles to her sister-in-law, Vanessa Lynn O'Neill of Atlanta. "I knew that when I got that novena - I knew that my mother's best friend was sick - I just knew at that moment that it was something I was going to do," Mrs. O'Neill told the Florida Catholic in an interview. "And that is how I got started, I just prayed the novena." The woman's recovery was investigated by an official church tribunal. The tribunal examined the evidence at hand and invited the participation of medical experts, who could find no earthly explanation for the woman's recovery. Charles has generally been seen by historians as an honourable figure who tried as emperor-king to halt World War I. The English writer, Herbert Vivian, wrote: "Charles was a great leader, a Prince of peace, who wanted to save the world from a year of war; a statesman with ideas to save his people from the complicated problems of his Empire; a King who loved his people, a fearless man, a noble soul, distinguished, a saint from whose grave blessings come." Furthermore, Anatole France, the French novelist, stated: "Emperor Charles is the only decent man to come out of the war in a leadership position, yet he was a saint and no one listened to him. He sincerely wanted peace, and therefore was despised by the whole world. It was a wonderful chance that was lost." All of these various viewpoints give weight to the words of Pope Saint Pius X during an audience with a young Charles: "I bless Archduke Charles, who will be the future Emperor of Austria and will help lead his countries and peoples to great honor and many blessings - but this will not become obvious until after his death." •	"Now, we must help each other to get to Heaven." Addressing Empress Zita on October 22, 1911, the day after their wedding. •	"I am an officer with all my body and soul, but I do not see how anyone who sees his dearest relations leaving for the front can love war." Addressing Empress Zita after the outbreak of World War I. •	"I have done my duty, as I came here to do. As crowned King, I not only have a right, I also have a duty. I must uphold the right, the dignity and honor of the Crown.... For me, this is not something light. With the last breath of my life I must take the path of duty. Whatever I regret, Our Lord and Savior has led me." Addressing Cardinal János Csernoch after the defeat of his attempt to regain the Hungarian throne in 1921. The British Government had vainly hoped that the Cardinal would be able to persuade him to renounce his title as King of Hungary. •	"I must suffer like this so my people will come together again." Spoken in Madeira, during his last illness. •	"I can't go on much longer... Thy will be done... Yes... Yes... As you will it... Jesus!" Reciting his last words while contemplating a crucifix held by Empress Zita. During the homily on October 3, 2004 at beatification of Charles of Austria, Pope John Paul II said: "The decisive task of Christians consists in seeking, recognizing and following God's will in all things. The Christian statesman, Charles of Austria, confronted this challenge every day. To his eyes, war appeared as "something appalling". Amid the tumult of the First World War, he strove to promote the peace initiative of my Predecessor, Benedict XV. From the beginning, the Emperor Charles conceived of his office as a holy service to his people. His chief concern was to follow the Christian vocation to holiness also in his political actions. For this reason, his thoughts turned to social assistance. May he be an example for all of us, especially for those who have political responsibilities in Europe today!"